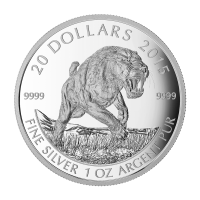 Order your 1 oz 2015 the American Scimitar Sabre Tooth cat silver coin from our store today for the lowest price online! 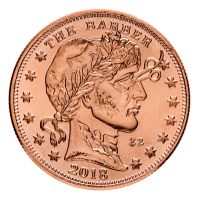 Enjoying an extremely low, 7500 unit mintage, the coins in this series are sought after for both their exquisite design and their rarity. 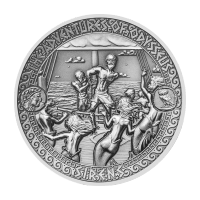 The reverse of the coin bears a fearsome rendition of homotherium serum, the scimitar cat, a smaller toothed but no less fearsome relative, the smilodon fatalis sabre tooth. Canadian artist, Julius Csotonyi, crafted the unforgettable reverse design, complete with striking physical attributes which were all checked for accuracy by the paleontologists at the Royal Tyrell Museum in Alberta. These remarkable, serrated toothed beasts roamed the Beringia grasslands between modern Alaska and Siberia, all the way to America’s Yukon valley, before their extinction some 13000 years ago. 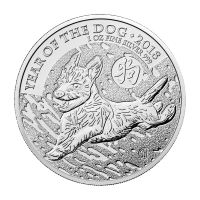 Enjoy the flawless design and prehistoric wonder of the 1 oz 2015 the American Scimitar Sabre Tooth cat silver coin by placing your order today. 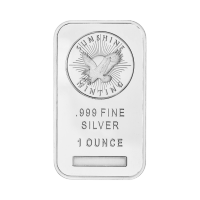 Reverse A Scimitar cat with it's mouth agape and the words "20 Dollars 9999 Fine Silver 1 oz Argent Pur"
A Scimitar cat with it's mouth agape and the words "20 Dollars 9999 Fine Silver 1 oz Argent Pur"
1 oz 2015 The American Scimitar Sabre Tooth Cat Silver Coin Order your 1 oz 2015 the American Scimitar Sabre Tooth cat silver coin from our store today for the lowest price online! Enjoying an extremely low, 7500 unit mintage, the coins in this series are sought after for both their exquisite design and their rarity. 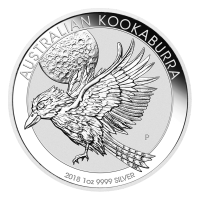 The reverse of the coin bears a fearsome rendition of homotherium serum, the scimitar cat, a smaller toothed but no less fearsome relative, the smilodon fatalis sabre tooth. Canadian artist, Julius Csotonyi, crafted the unforgettable reverse design, complete with striking physical attributes which were all checked for accuracy by the paleontologists at the Royal Tyrell Museum in Alberta. 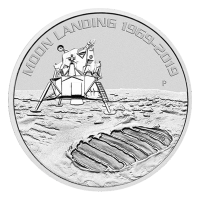 Also visible on the reverse, the coin’s denominational value and year of release, as well as its compositional weight and 9999 Silver purity. 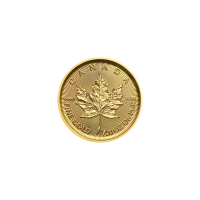 The coin’s obverse is home to a very simplistic but well rendered portrait of Queen Elizabeth II, together with her title and the coin’s country of origin, Canada. These remarkable, serrated toothed beasts roamed the Beringia grasslands between modern Alaska and Siberia, all the way to America’s Yukon valley, before their extinction some 13000 years ago. 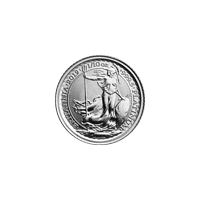 Enjoy the flawless design and prehistoric wonder of the 1 oz 2015 the American Scimitar Sabre Tooth cat silver coin by placing your order today.